The Pavan is an ancient Spanish‐Italian Dance form, solemn, slow and stately. It gained great popularity in Renaissance England, in which it developed from a straight dance form in the time of Henry VIII to a highly sophisticated composition of a slow, rhapsodic and fantasy‐like nature, in which the composer expressed his often melancholy emotions. The composers featured on this recording are Cotton, Ferrabosco, Philips, Johnson, Mason, Robinson, Dowland, Daniel, Bacheler and several anonymous. 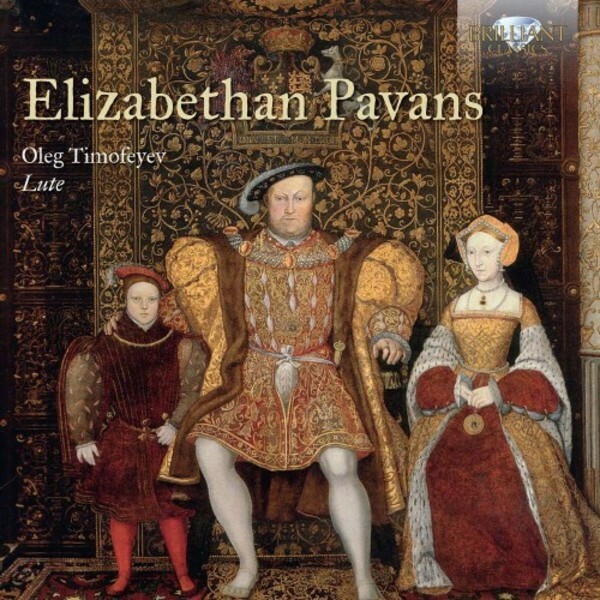 Oleg Timofeyev, a Russian‐born American lutenist, brings together a personal collection of some of his favourite Elizabethan pavans, each carefully chosen from lute books or unpublished manuscripts, spanning the length of Queen Elizabeth I�s reign. What intrigues Timofeyev is the special status that the pavan held during this time, and how it morphed from a simple dance to a slow, grand, fantasy‐like composition. This album showcases this fascinating development; from two pavans inspired by Elizabeth�s predecessor, King Henry VIII, the first of which includes a marvellous �fanfare� section, to a collection of anonymous pavans that utilised common harmonic progressions for the first time, delighting the post‐Renaissance listener. The famous John Dowland features on this release, with his tongue‐in‐cheek �Semper Dowland semper dolens� (a complaint that he never held a position at Elizabeth�s court), as well as Daniel Bacheler and John Daniel, whose eccentric, almost decadent style brought the art of the pavan to its highest degree of sophistication. Oleg Timofeyev is a lutenist, guitarist, musicologist and documentary film director. Since arriving in America in 1989, he has studied with the likes of Hopkinson Smith and Peter Williams, and has gone on to record dozens of CDs. He has been responsible for the revival of the seven-string Russian guitar, and in 2008 together with his wife he made a compelling documentary about his former guitar teacher, Kamill Frautschi.